You want to watch Insecure at the comfort of your own home? Perhaps you’re simply geo-locked out. 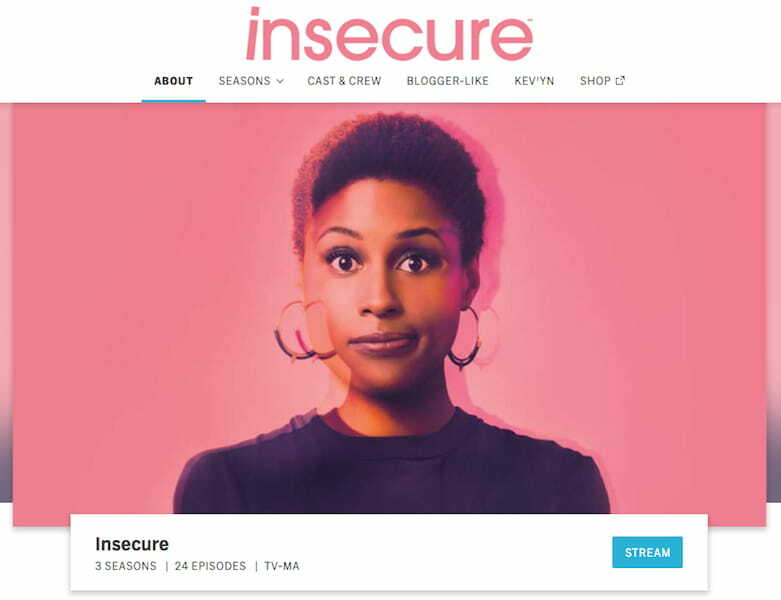 Here are some ways you can stream Insecure with ease. Insecure is an American comedy-drama television based on Issa Rae’s web series Awkward Black Girl created for premium cable network HBO. The series is centered on the life of Issa (as herself) and Molly (played by Yvonne Orji) and chronicles the adventures of the two women as they explore social and racial issues relating to love, color, gender and everything under the sun. The series premiered online on September 23, 201 via HBO Now to critical acclaim. It has received several nominations including a Golden Globe and an Emmy. HBO renewed the series for a 4th season on September 6, 2018. You can watch Insecure on Sundays at 10/9 c on HBO. If you’re wondering where you can watch online, you’re lucky. We’ve compiled a list – both official and unofficial – of ways to watch Insecure online. If you’re subscribed to HBO Now – its official streaming platform – for U.S. residents and certain regions, luckily for you. HBO offers all 3 seasons of the critically-acclaimed sitcom on its website for HBO Now subscribers. If you don’t, all you have to do is sign up, subscribe and watch all episodes of Insecure – no cable subscription needed. It’s that easy. There’s also a 7-day free trial for keeps if you’re willing to finish the whole 3 seasons in just a week. If you’re not residing in the U.S., that’s not entirely bad news. You can unblock the restriction through a VPN and still watch as if you’re in the U.S. Thanks to Amazon’s partnership with HBO, U.S. residents who are Amazon Prime subscribers can now watch all three seasons of Insecure. What’s more convenient is that you can choose where to stream – on your Amazon Prime account or on HBO. Super cool! You can also choose to buy episodes in SD or HD if you want to have your own copy. Try their 30-day free trial if you’re just starting out. If you’ve got an Apple Device and you’re looking for an alternative besides Amazon, then this section is for you. 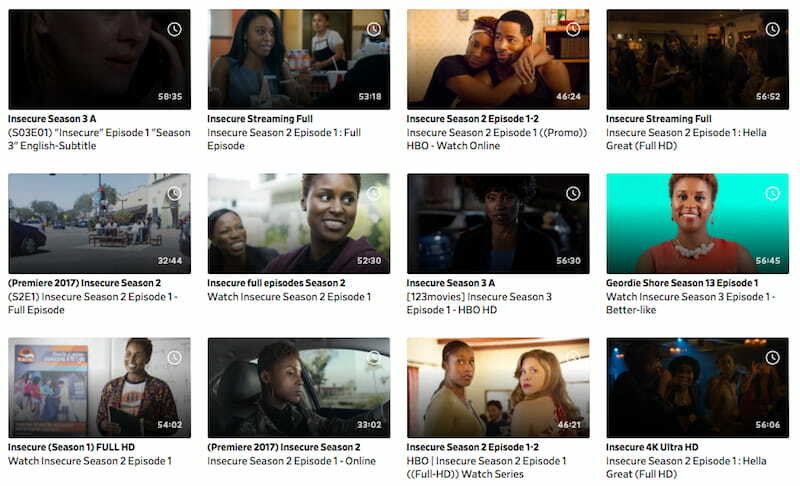 U.S. residents with iTunes accounts can watch all 24 episodes of Insecure on the app. Just log in, buy the episodes or seasons you want, in SD or HD, then stream your night away! It’s all easy and that as it even allows you to download the episodes. Ideal if you want to watch it when you travel, wherever you go. Not a U.S. resident? Just make an iTunes U.S. account then it’s good. If you’re looking for an alternative that’s worth your money, consider streaming platform Vudu. It’s basically the same as the others with a little bit of difference in pricing range, but all in all, it’s worth trying out. You can even download episodes in HDX or SD, just like iTunes. It’s truly convenient. It’s perfect for those who want a breather from popular streaming apps. Note: The season’s on sale so you’ll get the entire season in HDX at the same price as the SD. What more can you possibly want? Not everyone has the money to pay for premium streaming services. It may be a bit less costly at times, but it can quite add up. It’s okay. We’ll save your streaming life. 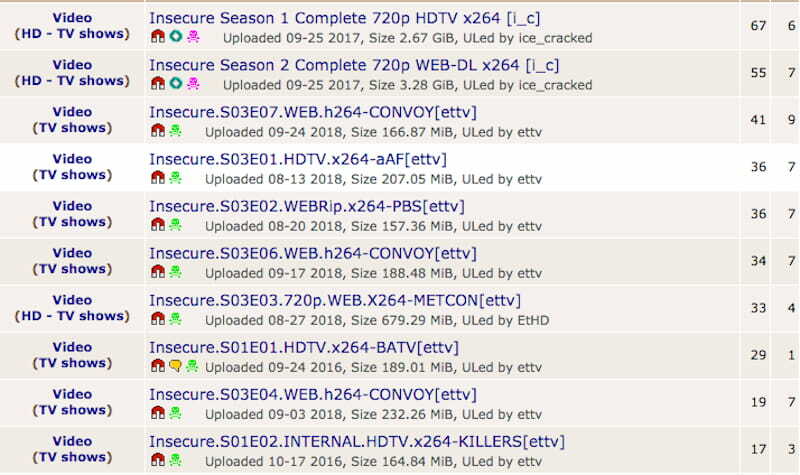 Here are the “unofficial” ways of watching Insecure online. We don’t guarantee that these will work though. Since Insecure is so popular, it’s no surprise that Youtube’s copyright infringement policy will block any potential upload of episodes on its streaming site. Youtube’s brother is a lot less strict when it comes to these kinds of things, so it’s your best alternative. Take note that since it’s an unofficial platform, you have to try out every video you can find on site, and be prepared that some might work while others may not. There can be lots of episode gaps, so practice patience. 123movies is another unofficial alternative streaming site that also carries TV series like Insecure. No need to make an account – just key in Insecure, click it, and you’re ready to stream. At the onset, it may look like a legitimate site with 3 seasons of Insecure up for grabs, but you actually need manual labor (and lots of patience) to test out all of it to find which ones work or not. And remember that since this is unofficial, there are lots of pop-ups which can be annoying. If after lots of clicking and broken links you’re left missing some episodes, do a bit of digging around Google. Type “where to watch insecure season 3 free” or “stream insecure season 3 online free”. If you tire yourself enough browsing on the Internet, you can find something that might actually work. But that’s not always 100% guaranteed. And it’s also legal to stream even if it’s uploaded illegally, provided you don’t share it. But you also need to beware of these sites – they carry lots of malware and viruses, so it’s best you gear up for protection. Enable your AdBlocker or subscribe to a premium VPN (some offer the same protection). Torrenting of copyrighted shows is illegal and punishable by law, and we do not condone it. If you download an episode, say through your subscription, it’s yours for the taking. But if you share it, it becomes illegal. Punishment includes possible jail time and paying a fine. It’s totally not worth the risk. What’s more is that you also make your private network vulnerable to malicious intrusions which can ruin your browsing experience. To avoid this scenario, take the time to learn how a VPN works. But if you still want to do torrenting, all we can say is check out our best VPNs for torrenting. Censorship or unavailability are only some of the ways to ruin your subscription on premium streaming sites. Or maybe you’re just on the road and are surprised that content originally available to you isn’t anymore. Wouldn’t want this to happen, don’t you? In such an event, the simplest way is to use a VPN to unblock these restrictions that prevent you from accessing such content. You can have your IP traffic re-routed on the U.S. so you can watch Insecure anytime, anywhere. Moreover, you can also protect yourself from cyber attacks and secure your data privacy. That’s three birds with one stone. There are top 2 performing VPNs in the industry that might just get your attention. Both guarantee enjoyment and security in browsing activity and experience so it’s worth checking them out. The best thing about ExpressVPN is that it is equipped with multiple servers that unblock geo-restrictions and torrenting. It also has 24/7 customer service, so you won’t get lost. It’s known to bypass streaming sites often sensitive to firewalls such as HBO and Amazon Prime and others if you’re in countries where content is restricted. That means more episodes of Insecure for you to watch. Neat. It’s priced at $8.32/month for a year – pretty reasonable to pay if you’re looking for stellar service, privacy protection, and adequate torrent support. That’s a good price to pay when compared to subscribing to premium streaming services such as Amazon, iTunes, and others. The $8.32 price tag can be quite pricey for some, so here’s another alternative, NordVPN. It offers the same services as the previous one less the customer service, but the server offering on 60+ countries is a fairly done deal. Their best plan? $2.99/month for a 3-year subscription. If you’d like to take your security and streaming experience in the long run and you want a VPN that values your money, this is it. With all these recommendations, grab some goodies and head on to your bed to start. HBO has yet to announce the premiere for Season 4, so you still have to watch all 24 episodes of the comedy television series everyone’s been talking about! Use any of our recommendations, or just check out our top VPNs for unblocking restrictions on streaming sites. Go check out what’s happening to Issa, now!